For a city as enormous and diverse as New Angeles, a comprehensive guide is impossible. Even a New Angelino might feel the need to access a map when first visiting a location in a district not their own. However, Shadow of the Beanstalk provides a full chapter dedicated the finer details of the various locales featured in the city and beyond. The city is split into twelve districts, eleven on earth and one on the moon. Over 500 million people call these districts their home, and Shadow of the Beanstalk provides a glimpse of each of them, from the starscrapers of Rutherford to the distant lunar colony of Heinlein. 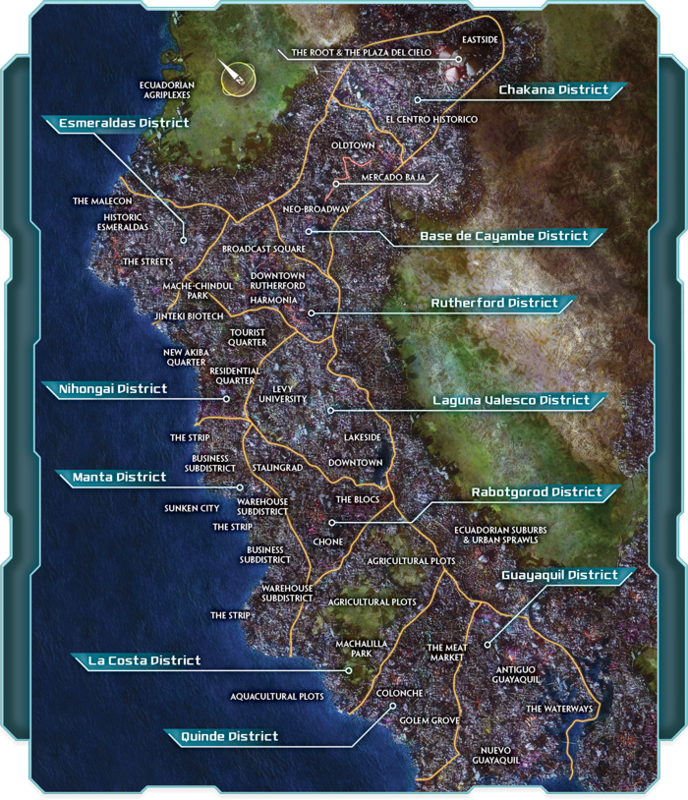 This sourcebook includes various locations around the district, maps, and NPCs who frequent these locales. While the city of New Angeles is so large it is nearly incomprehensible, with Shadow of the Beanstalk at your side, the perfect destination is always right around the corner. Not only does Shadow of the Beanstalk detail the city of New Angeles, it also includes plenty of NPCs to populate the megalopolis. In New Angeles, the citizens are as diverse as the endless cityscape, ranging from rich hedonists to the destitute denizens of the undercity, struggling to survive. 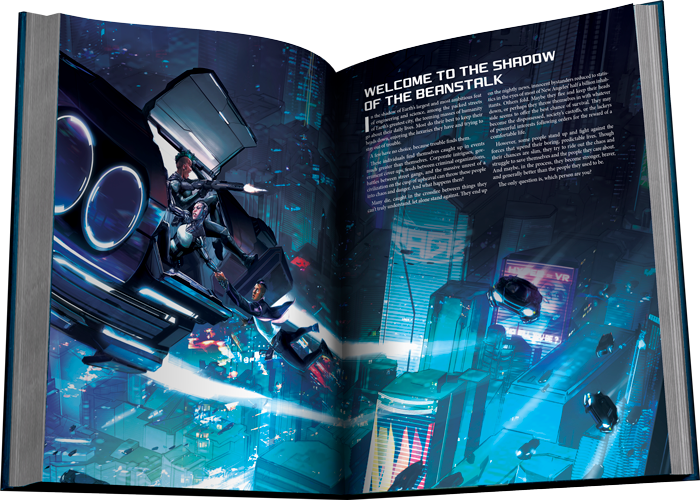 Shadow of the Beanstalk includes over 70 NPCs for use in your very own cyberpunk campaign. Disenfrancistos live off the grid in New Angeles’s undercity, and they encompass everyone from homeless panhandlers to those who choose to live a life away from the corporate controlled world that exists above plaza level. Many disenfrancistos get by on odd jobs, scavenge the undercity for valuable finds, and sleep in disused transit tunnels, clone barracks, bioroid warehouses, and other squats. Disenfrancistos are found in droves throughout New Angeles, and can make for a great minion group for the players to encounter during a campaign. The stats for one of the disenfrancistos. In a megapolis as polarized as New Angeles, there is never a shortage of salacious scandal, corruption, or murder to write about. Referred to as “news-nosies,” reporters spend their days tracking down stories, often in the less-than-safe undercity. As your characters get embroiled in the crime and conspiracies of New Angeles, the news may prove to be a consistent nuisance, or a valuable ally. Either way, Shadow of the Beanstalk gives you the tools you need to include an intrepid reporter in your games. The stats for a reporter in Shadow of the Beanstalk. 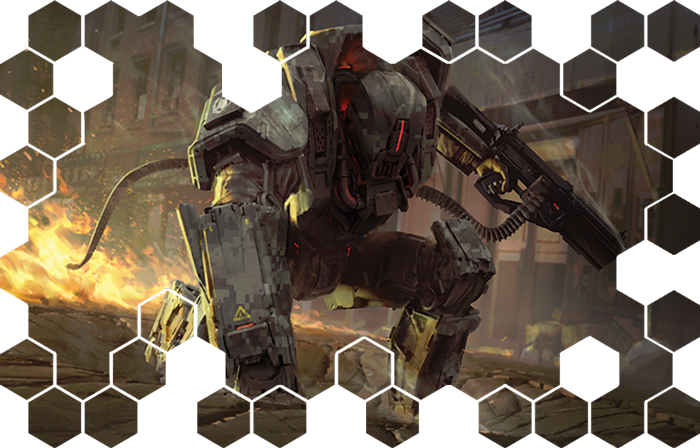 Should your characters get involved in the corporate intrigue of New Angeles, it's likely they will come in contact with the massive resources these powerful organizations wield, including the SXC Exosuit. 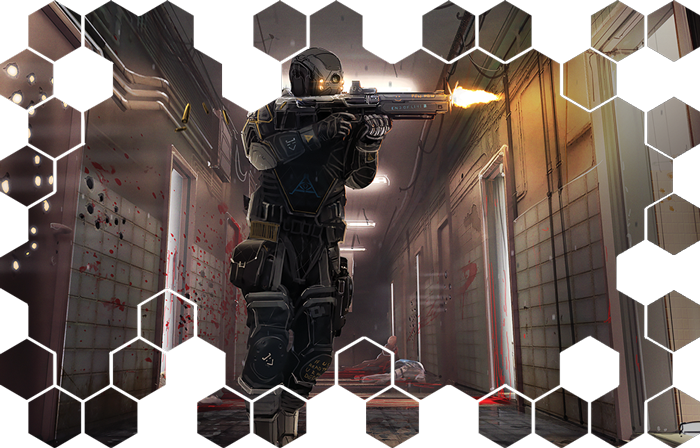 An exosuit on the loose in a metropolitan area like New Angeles is the kind of threat that keeps police commissioners up at night. While the largest exosuits are basically walking tanks, even the smaller “person-sized” suits used in each SXC battalion can turn a single soldier into a fast, well-armored, and highly lethal threat. They can deploy either as infantry support units or en masse as an armored line, and they can even drop from orbit. Of course, tangling with an Exosuit Pilot is a rare occurrence for any citizen of New Angeles, but in the neon glow of this megalopolis, anything can happen. The stats for an Exosuit Pilot, ready to confront the NPCs. The final chapter in Shadow of the Beanstalk describes how to bring these characters and situations to life as the Game Master. 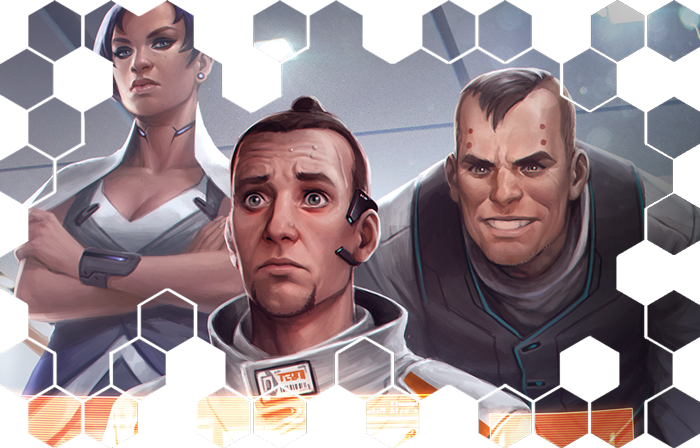 Through unique social encounters and an adventure builder included in the sourcebook, you can bring the conspiracies and intrigue of the Android universe to your tabletop. Through selecting a variety of hooks, escalations, and climaxes provided in the book, Game Masters can create modular adventure frameworks, complete with twists, turns, and moral quandaries for the party to face. These modular adventure acts can be rejiggered and combined in new and interesting ways. A hook can be replayed several times with a completely different escalation and climax, resulting in a wildly different adventure. With enough change in set dressing, even the same old hook can feel completely different! No matter where your adventure is headed, it starts with the hook—a starting concept to get your players moving into a broader adventure. Each hook consists of three major parts; the primary goal, the challenges, and the twist. The primary goal is what your PCs are trying to accomplish, the challenges are what stand in the character’s way, the twist is an unexpected complication that take characters by surprise. These hooks can range from an airplane heist job to tracking down a rogue experimental clone, and they simply form the basis for an adventure. An escalation is a rise, either in the stakes or in the difficulty of the adventure, and it's usually the point where the waters of morality beomce muddy. There is often a plot twist of some kind that shows the players that the milk run they signed up for isn’t as cut and dried as advertised. Perhaps a third party gets involved in the job—whether it’s a rival corporation or an orgcrime faction, this complicates things for your players and creates new challenges. Finally, the climax generally represents how the most powerful organization involved wants to attempt to resolve the issue. This organization is probably a powerful corporation or orgcrime faction, but it could also be a religious group or a government. It could be that a higher-up just discovered the actions of their underlings, and orders a radically different course of action. Perhaps the organization decides to cut their losses, silencing everyone involved in the operation, or maybe they decide to place their bets in court, calling in the NAPD to cause trouble for everyone involved. While the climax represents how the most powerful organization wants events to unfold, the players still have the agency to determine how their adventure will end. With a full data vault of hooks, escalations, and climaxes to choose from and improvise with, Shadow of the Beanstalk is the perfect starting point to your own cyberpunk adventure in the Android universe or beyond! With so many places to see and people to meet, New Angeles is an intimidating city. 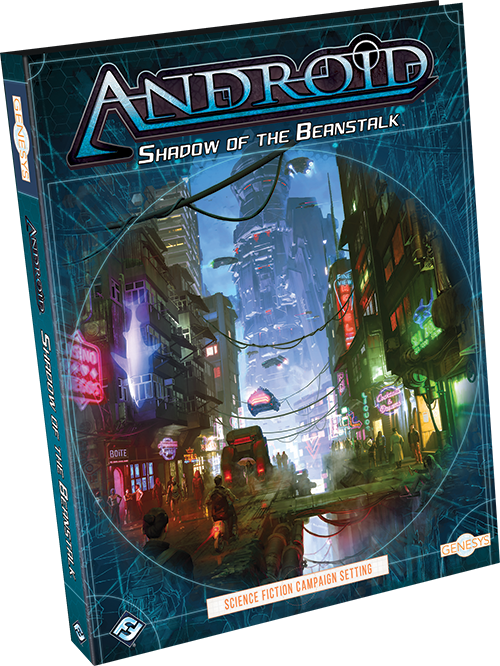 But with Shadow of the Beanstalk and The Worlds of Android to supplement it, you can always have a new adventure rich with lore and backstory to immerse your players in a cyberpunk future. What new stories will you tell? Embrace the future with Shadow of the Beanstalk (GNS04), available now for pre-order from your local retailer or our website!